To migrate tickets that are currently shared with JIRA v2 over to version 3 of the integration, it would be useful to have a list of the shared tickets and issues. See Migrating to the JIRA integration v3 for more information on migrating. 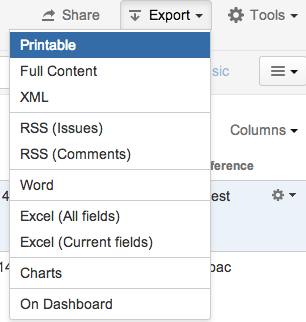 Here's how to export such a list from JIRA. Log in into your JIRA account as a user with the JIRA Administrators global permission . Select Fields > Custom Fields to open the Custom Fields page. Locate your Ticket Reference custom field. 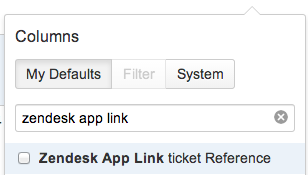 It should be named "<Zendesk Connection Name> Ticket Reference". Choose Issues > Search for Issues . The issue navigator will be displayed. If the Advanced link is displayed, click it to switch to advanced searching. Search for the custom field ID where the field is not set to empty. This search will include all JIRA issues with tickets linked to them. If you'd like to include the ticket # in the export for easier viewing, select 'Column' and add the connection ticket reference field as an additional column. You can also add additional fields that you might find useful. Select 'Export' and choose your preffered file format. You can have a full list of all shared JIRA issues and tickets.